Does it make sense to replace your computers every three years once the warranty has expired? This practice would keep you up to date at all times, and it might be a boon for the environment if you went for the latest, power-saving technology. Or, does it make more sense to rejuvenate your old hardware? This approach would save money and might be more environmentally friendly, because it removes the need to build a new PC and dispose of the old one. A survey titled “Total Cost of Ownership & Green IT” by the Innsbruck Kompetenzzentrum IT (Innsbruck Competence Center for IT), Kufstein University, and IZES Institut für ZukunftsEnergieSysteme (Institute for Future Energy Systems) GmbH   investigated precisely this topic. The question the researchers set out to answer was: How economical and ecological is replacing or upgrading your complete hardware every three years – taking a total period of nine years into account? “The economic situation was mainly evaluated with reference to our total cost of ownership calculations,” the authors wrote. They calculated the total cost of ownership (TCO) with reference to 11 individual factors, covering all costs that occur in the course of procurement, use, and disposal of the equipment – including the disposal of electronic waste. The calculations also indirectly included costs of installation, maintenance, and failure, as well as risk costs. According to explanation of the survey, these environmental costs were mainly based on CO2 calculations performed by IZES. The researchers attempted to account for both the CO2 emissions of the various IT devices throughout their service life and for the CO2 that occurs during production and disposal of the equipment (Figure 1). Figure 1: The researcher’s equations covered CO2 emissions during the entire product lifecycle: manufacturing, operation of a 120-watt machine eight hours a day for six years, standby (14 watts, 16 hours a day), and recycling. The second main factor for evaluating the environmental impact was a lifecycle assessment, meaning the costs that occur during production, use, and disposal of the IT infrastructure and that are detrimental to the environment, such as the costs for non-renewable raw materials. The disposal of electronic waste and other hazardous elements has an environmental impact and incurs costs that must be considered. Understandably, the survey was unable to take a potentially infinite number of cases into consideration but limited itself to typical scenarios. The authors focused on four enterprise sizes and assumed typical equipment, as detailed in Table 1. In the case of the sole proprietorship, they assumed a desktop PC and a laptop. The survey analysts assumed a unit price for each item of equipment with the total sums for the value of IT equipment lying between a few thousand Euros (sole proprietorship) and about 6 million Euros (large corporation). The total period of the study was divided into segments of three years each, because this reflects both the typical warranty period and the typical write-down period for PCs as the main component. Additionally, the survey looked at the basic options of upgrading or buying new equipment in each of the four business categories. In the case of purchase option, the anticipated price development was taken into consideration. The upgrade variant turned out to be fairly tricky to calculate because individual components often can’t be replaced independently. For the TCO calculations of the sole proprietorship, the small business, and the mid-cap business, the researchers thus assumed an upgrade scenario that included replacing the motherboard with on-board graphics and sound, the CPU, the RAM (1,024MB), and the hard disk (320GB). After investigating prices, the authors found that the hardware cost for an upgrade would be about half of the cost of a new machine. For large corporations, the researchers only applied the component upgrade assumption to servers; instead of fat clients, large corporations were assumed to use thin clients with a purchasing price of EUR 300 each. The TCO calculations included both direct and indirect costs. Direct costs included procurement costs for new hardware (half of this for upgrades), expenditures for installing and integrating the new technology, and expenditures for collection and disposal of the old equipment. Because some of the old machines were assumed to be usable and sellable yet, the calculations also itemized expenditures and returns on these sales. Indirect costs measured included research in the course of preparing for the investment (possibly by bringing in external consultants) and the need to train staff and administrators. Added to this were operating costs and downtime costs as a result of upgrading the hardware. The survey didn’t actually work with these costs, because a corporation would tend to avoid such downtime under all circumstances. The researchers also evaluated the environmental friendliness of the individual solutions. According to the survey, they investigated the environmental friendliness of the computer components throughout their complete lifecycle with respect to power consumption and CO2 footprint. In the researchers’ definition, the complete lifecycle includes: production of the raw materials, provision of materials used, or both; manufacture of individual components; assembly of components needed to create a PC; use of the equipment; and disposal, including by recycling and sending to a landfill the non-reusable components. The calculations assume new technology will always use less energy, and a CO2 savings effect is derived from this. Given an energy supply like that in Figure 2, CO2 emissions of 550 grams per kilowatt-hour can be assumed, according to a survey by Greenpeace. This value was used by the researchers in their calculations. 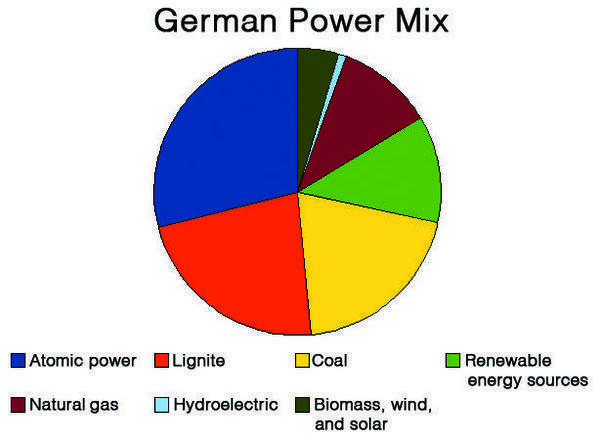 Figure 2: Sources of energy in Germany. Generating power costs an average of 550 grams of CO2 per kilowatt-hour. Results were also based on data collected directly from one business per category for average equipment, power consumption, age, service life, and operating hours of technical equipment, as well as research in publications and on the Internet. The researchers compared a number of different sources, and, in many cases, the results they obtained clearly contradicted figures provided by equipment manufacturers. The reference model for PC energy consumption measurements was an Acer Aspire M3610A, which proved to be the most energy-efficient model, consuming 75 watts during operations and just 6 watts in standby mode. The consumption figures for all models measured in small businesses ranged between 91 and 170 watts during operations. Figures for standby mode differed considerably, with an upper limit of 9 watts, which would have a pronounced effect on energy bills. As expected, the newer models were more efficient, with RAM in particular achieving a higher standard of efficiency. Because computers used by mid-caps tended to be newer compared with smaller companies, their energy balance was also better (power consumption of between 74 and 96 watts under an average load and up to 140 watts at maximum load). The differences were far greater in the case of servers, for which the difference between the lowest and highest power consumption averaged 251 watts and went up to 448 watts at maximum load. In the case of the large corporation, thin clients, with just one quarter of the power consumption of a normal PC, were investigated as an alternative. For all four business sizes, the TCO calculations assumed that the business would either replace or upgrade its old hardware after three years. 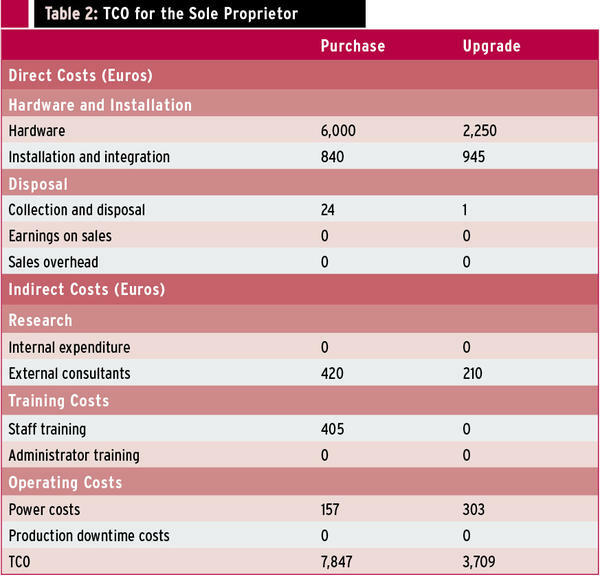 A sole proprietor would save more than EUR 4,000 over a period of nine years by upgrading; the researchers assumed that the business owner would need consultancy services and training when purchasing a new machine (Table 2). Like sole proprietors, small business don’t have their own IT departments and would need to train at least one administrator. The cost of training with a new investment would be similar to the power savings achieved by more modern hardware. This still leaves the far higher cost of the hardware, which would make purchasing new machines at more than EUR 17,000 more expensive than upgrading (Table 3). The mid-cap businesses in the survey have their own IT department, which can handle research and consultancy, thus generating internal expenditure. Having more new computers obviously saves more power, so this factor becomes significant for the first time, at a figure of nearly EUR 1,000 per year. Despite this, upgrading is still far cheaper than buying new machines (Table 4). The large corporation in the survey’s model opts for thin clients. 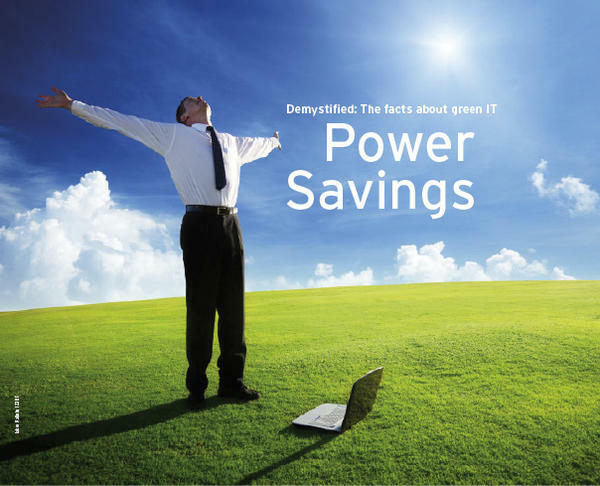 Power consumption of just 25 percent compared with a normal PC translates to power savings with a value of nearly EUR 100,000, but this amount is nothing like enough to compensate for the additional cost of buying new machines (Table 5). Regardless of the size of a business, buying completely new hardware every three years is the more expensive approach (Table 6). However, the ecological benefits could be so substantial that you might still decide to take this approach. To determine the best solution, the ecological effect of the two strategies must also be considered. Analysis of the ecological effects in the scope of the survey covered the entire lifecycle of the PC. The authors wrote that the aim of lifecycle analysis was to identify the computer components and analyze the energy consumption and CO2 emissions throughout the computer’s complete lifecycle. The investigation was restricted to the composition of energy expenditures and the resulting CO2 emissions in each part of the lifecycle. The manufacturing process for a computer consumes 2,136 megajoules (MJ) of energy and produces around 147kg CO2 emissions. Most of this (1,447MJ energy and 98.92kg CO2) is caused by production of the raw materials; manufacturing the finished product only consumes 286MJ of energy and produces 17.03kg CO2; the remainder is attributable to the distribution phase. These values can be broken down for individual components, as you can see in Table 7. 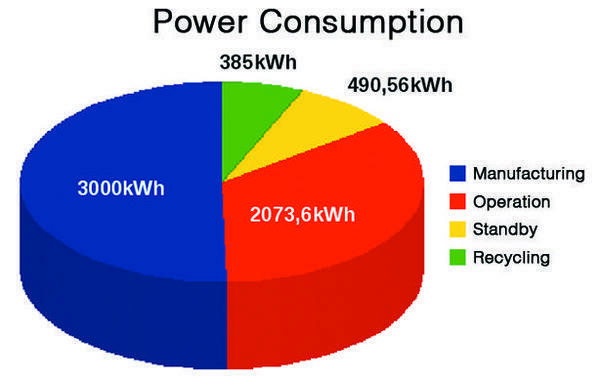 Most of the energy consumption and the CO2 emissions are attributable to the motherboard, followed by the power supply. The researchers assessed the operational phase based on the energy consumption measurements for operations referred to earlier. The average hourly power consumption for a PC was 81 watts, compared with 188 watts for a server, 37 for a display, 300 for a printer, and 46 for a laptop. In medium-sized businesses, the power consumption figure for all IT equipment was 1,319 watts per house; this is equivalent to 87 percent of the power consumption of the whole business, say the authors, especially in standby operation. An upgrade should be performed after the first three years; new equipment should be purchased after another three years. In other words, both variants – purchasing and upgrading – should alternate to achieve an ecological optimum. Other considerations lead to the conclusion that upgrading after three years is not the most ecological variant because only a small part of the three years, seven months to be precise, can be classified as energy efficient. In the remaining two years and five months, the computer has an inefficient status from an ecological point of view. Thus, the survey concludes that purchasing new equipment every three years is preferable to upgrading from an ecological point of view. The survey also states that the optimum replacement cycle is three years and seven months. The survey ends with a draw: Seen economically, upgrading makes more sense and is definitely cheaper, whereas the environment benefits more from purchasing new equipment. Energy-efficient new hardware doesn’t entail any economic benefits, but it does offer ecological ones. For various reasons, the survey was unable to take a number of factors into consideration. However, additional criteria could be added in the course of individual investigations in the scope of real-life projects based on the methods used in the survey. Computers age quickly and sometimes are unable to keep pace with rejuvenated software made more complex with every release. We examine the total cost of replacing compared with upgrading your machines. Many applications interrupt the CPU when it tries to sleep. PowerTOP not only identifies these evildoers but also provides tips on how to get rid of them.